Niall Horan & Harry Styles have set the pulses of their female fans racing & we have the pictures to prove it as they both stripped down and posted shirtless pictures of themselves on twitter. So it’s uncertain what the exact affect images of shirtless Harry Styles and Niall Horan could potentially have on the band’s fans. Pictured showcasing their toned physiques, the boys, both 19, appeared to misplace their tops in a few cheeky Twitter snaps. In the two shots of Harry, the curly haired teenager has clearly been caught off guard as he appears to be mid-sentence. Pointing as he stares directly into the camera lens, Styles puts a few tattoos from his growing collection on display. With the images causing quite a buzz on the Twittersphere as they circulate at a rapid pace, fans of the What Makes You Beautiful singer had only praises for the heartthrob. Meanwhile a photo of Harry’s Irish bandmate Niall was also doing its rounds on the micro-blogging site on Sunday. Proving that he’s been pumping some iron in the gym, Horan looked confident as he walked through a hallway in a pair of blue tracksuit bottoms as he flashed his designer underwear. 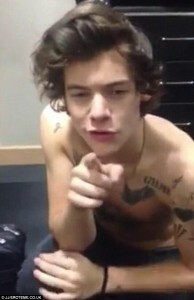 Harry Styles poses shirtless on twitter. Niall Horan poses shirtless on twitter.